This is Miracle Reviews, where we might just see a Miracle Game. Before I start the review, I just want to apologize for not reviewing as frequently as I wish I could. School and American Football have been getting in the way, so I didn't have much time to acomplish this goal. Sorry, but here is my review. In the past few weeks or so I've been wanting to play a platform game that is great, and has a new concept in game making. As I scrolled through the featured game page, I come upon this game, and figure out that this might be the one. I don't know anything about greatzgames, but all I can say after the game is that me makes greatzgames. And let me tell you... this is not simple. As I start the game, I look around for a switch that controls the skull doors, knowing that the game could end early for me. As I roll right, I encounter a few enemies, but using my new technique - using a shield - I basicially get no damage from the enemies. The scenery at this point is good, and I can see that all of the action is building up at a great pace so far, and it wouldn't stop growing. Even though I didn't beat the game, I got far enough to say to myself, "Oh my god. This game is great." The rest of the first level was great, and not spread at all. It was at a great pace, and there were many techniques that could be used, so that is a well thought game. Everything in this game was very well thought out, and it was very simple indeed, lol. I was expecting a little less than this, but I wasn't expecting a little. Whenever I see a new user that has a feature game, I expect a lot because usually these things don't happen too often. And this game brought my standards to a whole new level. Now, let me tell you about the placement of this level, which I rarely talk about. Everything in this game was placed right, all of the enemies were attacking you from both sides, and the surrounding traps worked effectivly. So, everything in this game was almost perfect. :P The first level might've stood out more then the 2nd and 3rd level, but the next two levels weren't as well thought out, but they still were very fun to play, and they definitely had more action in it, but some of the action was overloaded. One thing I also liked was the health, and even though there was a lot of it, it was placed perfectly, and exactly when you wanted it. Now lets move on to the next two levels. These next two levels actually include some major puzzles that would effect you for the rest of the game. There were a few puzzles that were so harsh that almost everytime you would lose. It was pretty crazy. The one that I would like to point out was in level three, there was a ladder that led up to a few ladders up high, and if you skipped this ladder, you would have to use a hop, skip and a jump to pass at least 10 natives. There were also a few major puzzles that I don't want to spoil for you. In these levels there is definitely a lot more thinking involved, and also there is a lot of confusion as well. 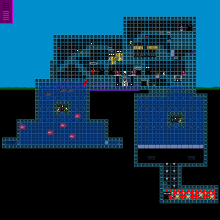 In the second level there was a lot of confusion with the bottom of the spawning point, having a few coin doors and 2 coins leading up to the level door. As this was a little confusing, little did I know that the rest of the game would be at least 2x worse. Even though there was a little bit of confusion, the puzzles were still pretty cool. I had a lot of fun with this game, and I had a great run with the game. :3 Greatgamez, I believe that if you keep making these type of games then you can be a legend. Great job. Lets just say I wasn't surprised, and that greatzgames did a great job overall with owning a great featured game. You really did deserve this feature because almost everything was perfect, and you did all of the gameplay plus action and puzzles at a very high level. I think that this game was well tested, and had a great inspiration factor to all users. It was a great game overall, and defenitely inspired me to make platformer games with a new concept, and more puzzles that can be used on and on. Great job Greatzgames. Overall, this game recieves a 4.6. This game inspired me, and should inspire many other users as well. This game was a great game that I will never forget. Great job Greatzgames. You make great games. You had a great effort.